Perhaps it's application fatigue. Perhaps it's incessant friend request. 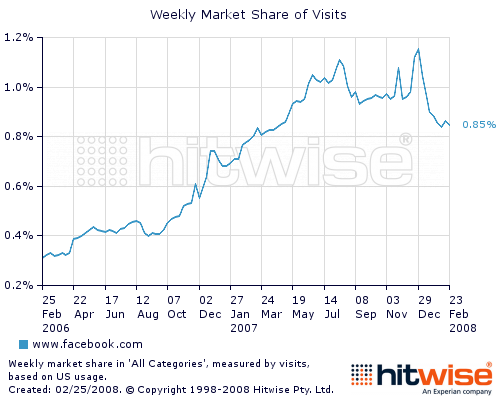 Perhaps it's social media overload but according to Hitwise, traffic to Facebook is down 27 percent for the week ending February 23 from a high during the holidays. Hitwise acknowledges this could be a seasonal trend citing traffic increases during both the Thanksgiving and Christmas breaks due to a significant portion of Facebook's users (40 percent 18-24) being out of school and having more time to use the site. Even with some decline, the average time spent on Face book has steadily increased from just under five seconds in February 2006 to 21 seconds in February 2008. Noting recent peaks in traffic coincide with less time spent on the site, Hitwise hypothesizes the traffic increases are coming from less active users. As we've said before, people come and people go. When a shiny new object shows up, everyone at least has to check it out. It's unclear if there's actually a new shiny object out there at this point aside from an expansive plethora of widgetized web 2.0 goodies but Facebook's shine won't last forever.